Add short-hop wireless to your Feather with these Radio Featherwings. These add-ons for any Feather board will let you integrate packetized radio (with the RFM69 radio) or LoRa radio (with the RFM9x's). These radios are good options for kilometer-range radio, and paired with one of our WiFi, cellular or Bluetooth Feathers, will let you bridge from 433/900 MHz to the Internet or your mobile device. The radio modules themselves have the same pinout so the PCB is the same, but the library usage and wiring may vary. All use SPI for interfacing, and there are great Arduino libraries available for both. Currently tested to work with the Feather ESP8266, Feather 32u4, Feather M0, WICED Feather (RFM69 library only) and Teensy 3 Feather series, some wiring is required to configure the FeatherWing for the chipset you plan to use. Because each Feather uses a different processor, there is some light wiring that needs to be done to configure the radio pins. In particular, an interrupt-capable pin is required for IRQ but there is no one irq pin that is the same on all the Feathers! #define RFM95_CS  2    // "E"
#define RFM95_RST 16   // "D"
#define RFM95_INT 15   // "B"
The 32u4 doesn't have a lot of IRQs and the only ones available are on pins 0, 1, 2, 3 which are also the Serial RX/TX and I2C pins. So it's not great because you have to give up one of those pins. #define RFM95_CS  10   // "B"
#define RFM95_RST 11   // "A"
#define RFM69_CS      10   // "B"
#define RFM69_RST     11   // "A"
#define RFM95_INT  6   // "D"
#define RFM69_IRQ     6    // "D"
For other boards like the ESP32 or nRF52, any pin can be an interrupt, so feel free to use any wiring setup you like! 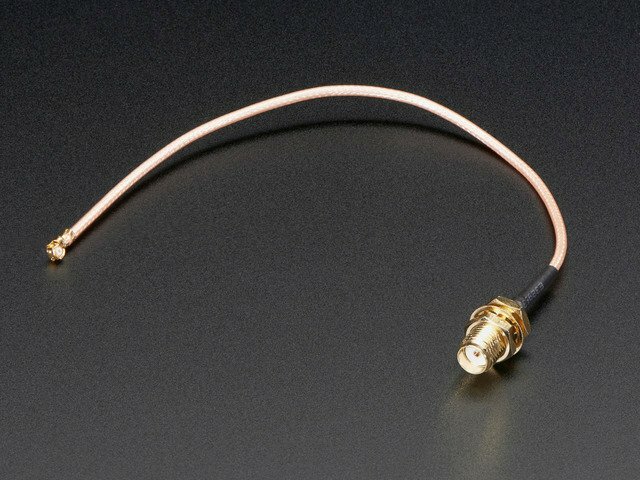 A wire antenna, aka "quarter wave whip antenna" is low cost and works very well! You just have to cut the wire down to the right length. Strip a mm or two off the end of the wire, tin and solder into the ANT pad. If you want an external antenna that is a few inches away from the radio, you need to do a tiny bit more work but its not too difficult. 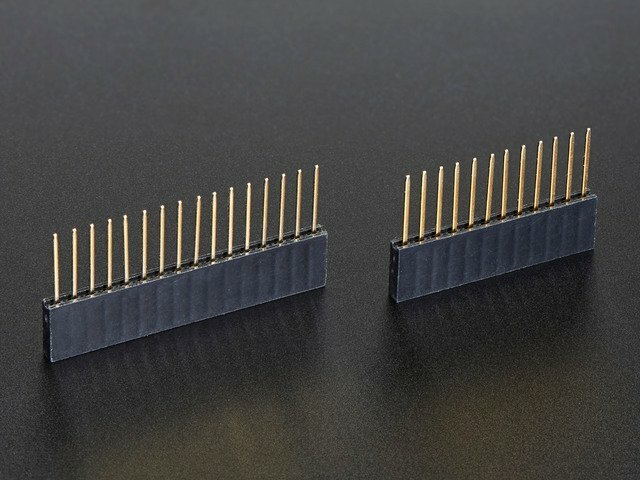 uFL connectors are rated for 30 connection cycles, but be careful when connecting/disconnecting to not rip the pads off the PCB. 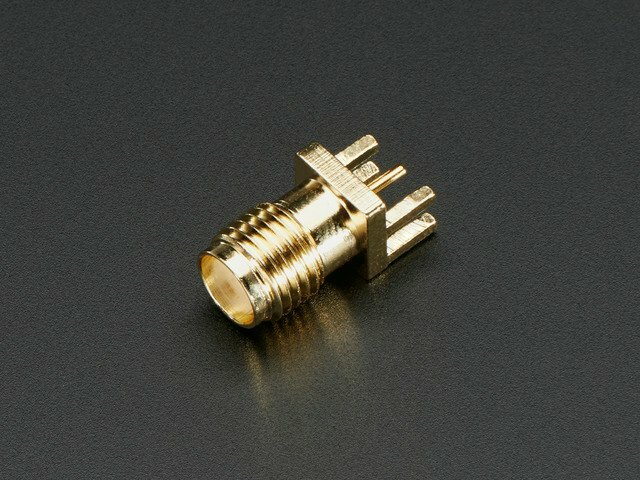 Once a uFL/SMA adapter is connected, use strain relief! 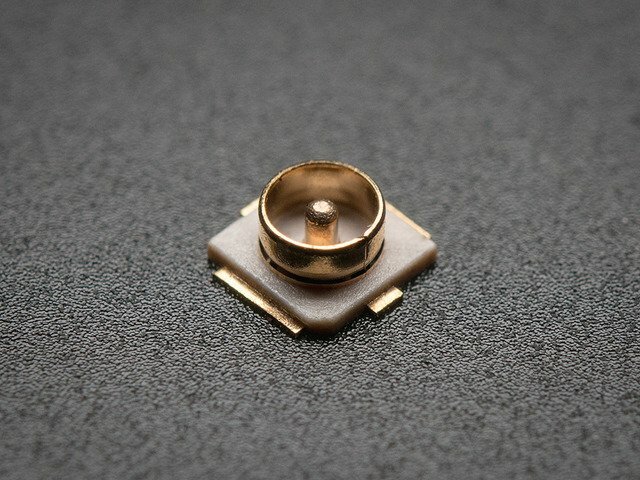 Check the bottom of the uFL connector, note that there's two large side pads (ground) and a little inlet pad. The other small pad is not used! This page is shared between the RFM69 breakout and the all-in-one Feather RFM69's. The example code and overall functionality is the same, only the pinouts used may differ! Just make sure the example code is using the pins you have wired up. Before beginning make sure you have your Arduino or Feather working smoothly, it will make this part a lot easier. Once you have the basic functionality going - you can upload code, blink an LED, use the serial output, etc. you can then upgrade to using the radio itself. You will, of course, need at least two paired radios to do any testing! The radios must be matched in frequency (e.g. 900 MHz & 900 MHz are ok, 900 MHz & 433 MHz are not). They also must use the same encoding schemes, you cannot have a 900 MHz RFM69 packet radio talk to a 900 MHz RFM9x LoRa radio. The SX1231 can be used in a 'raw rx/tx' mode where it just modulates incoming bits from pin #2 and sends them on the radio, however there's no error correction or addressing so we wont be covering that technique. These are really great Arduino Libraries, so please support both companies in thanks for their efforts! We recommend using the Radiohead library - it is very cross-platform friendly and used a lot in the community! Place the RadioHead library folder in your arduinosketchfolder/libraries/ folder. You may need to create the libraries subfolder if it's your first library. Restart the IDE. This code will send a small packet of data once a second to another RFM69 radio, without any addressing. Load this code into your Transmitter Arduino or Feather! These examples are optimized for the Feather 32u4/M0. If you're using differnet wiring, uncomment/comment/edit the sections defining the pins depending on which chipset and wiring you are using! The pins used will vary depending on your setup! Now open up another instance of the Arduino IDE - this is so you can see the serial console output from the TX device while you set up the RX device. This code will receive and reply with a small packet of data. Load this code into your Receiver Arduino/Feather! Each radio has a frequency that is configurable in software. You can actually tune outside the recommended frequency, but the range won't be good. 900 MHz can be tuned from about 850-950MHz with good performance. 433 MHz radios can be tuned from 400-460 MHz or so. // Change to 434.0 or other frequency, must match RX's freq! At the top of the sketch you can also set the pinout. The radios will use hardware SPI, but you can select any pins for RFM69_CS (an output), RFM_IRQ (an input) and RFM_RST (an output). RFM_RST is manually used to reset the radio at the beginning of the sketch. RFM_IRQ must be an interrupt-capable pin. Check your board to determine which pins you can use! Also, an LED is defined. #define RFM69_RST     2  // "A"
You can then instantiate the radio object with our custom pin numbers. Note that the IRQ is defined by the IRQ pin not number (sometimes they differ). If you are using a board with 'native USB' make sure the while (!Serial) line is commented out if you are not tethering to a computer, as it will cause the microcontroller to halt until a USB connection is made! Once initialized, you can set up the frequency, transmission power, radio type and encryption key. For transmission power you can select from 14 to 20 dBi. Lower numbers use less power, but have less range. The second argument to the function is whether it is an HCW type radio, with extra amplifier. This should always be set to true! delay(1000);  // Wait 1 second between transmits, could also 'sleep' here! Its pretty simple, the delay does the waiting, you can replace that with low power sleep code. Then it generates the packet and appends a number that increases every tx. Then it simply calls send() waitPacketSent() to wait until is is done transmitting. It will then wait up to 500 milliseconds for a reply from the receiver with waitAvailableTimeout(500). If there is a reply, it will print it out. If not, it will complain nothing was received. Either way the transmitter will continue the loop and sleep for a second until the next TX. Instead of transmitting, it is constantly checking if there's any data packets that have been received. available() will return true if a packet with the proper encryption has been received. If so, the receiver prints it out. It also prints out the RSSI which is the receiver signal strength indicator. This number will range from about -15 to -80. The larger the number (-15 being the highest you'll likely see) the stronger the signal. If the data contains the text "Hello World" it will also reply to the packet. OK once you have that going you can try this example, RadioHead69_RawDemoTXRX_OLED. We're using the Feather with an OLED wing but in theory you can run the code without the OLED and connect three buttons to GPIO #9, 6, and 5 on the Feathers. Upload the same code to each Feather. When you press buttons on one Feather they will be printed out on the other one, and vice versa. Very handy for testing bi-directional communication! This demo code shows how you can listen for packets and also check for button presses (or sensor data or whatever you like) and send them back and forth between the two radios! OK so the basic demo is well and good but you have to do a lot of management of the connection to make sure packets were received. Instead of manually sending acknowledgements, you can have the RFM69 and library do it for you! Thus the Reliable Datagram part of the RadioHead library. Don't forget to check the frequency set in the example, and that the pinouts match your wiring!!! // Where to send packets to! Because the data is being sent to address #1, but #1 is not acknowledging that data. Turn on the client and you'll see acknowledged packets! It's easy to use the RFM69HCW radio with CircuitPython and the Adafruit CircuitPython RFM69 module. This module allows you to easily write Python code that sends and receives packets of data with the radio. Be careful to note this library is for the RFM69 radio only and will not work with the RFM9X LoRa radios! You can only send and receive packets up to 60 bytes in length at a time. The size of the radio's internal buffer dictates this limit so if you want to send longer messages you'll need to break them into a series of smaller send calls in your application code. Receiving packets is a 'best effort' in pure Python code. Unlike the Arduino versions of the RFM69 library there is no interrupt support which means when a packet is received it must be immediately processed by the Python code or it could be lost. For your application it will work best to only receive small, single packet messages at a time. Don't try to receive kilobytes of data or else you'll lose packets. This module is really intended for simple single packet messages like 'ON', 'OFF', etc. Sending and receiving packets will 'block' your Python code until the packet is fully processed. This means you can't do a lot of other things while sending and waiting for packets to be received. Design your application so the radio usage is the primary scenario and very little other tasks need to happen in the background. The module is written to be compatible with the RadioHead RFM69 Arduino library. This means by default the module will setup the radio with the same GFSK, 250kbit/s, 250khz deviation, and bit whitening radio configuration so it can send and receive data with itself and other RadioHead-driven modules. In addition the CircuitPython module uses the same sync word and packet preamble (4 bytes) as RadioHead. If you want to use different modulations or settings you'll need to configure the radio yourself (see the initialization code for the registers and bits to access, however you will need to consult the datasheet for the necessary values). The CircuitPython module does not support advanced RadioHead features like guaranteed delivery or its internal node addressing scheme. Only the simple 'raw' RadioHead examples are supported (i.e. broadcasting a packet to all listening radios). You can however enable encryption and set an AES encryption key just like with the RadioHead library. If you need guaranteed delivery or other advanced features you'll need to implement them in your application code, or design your application be resilient to failures or missed messages. 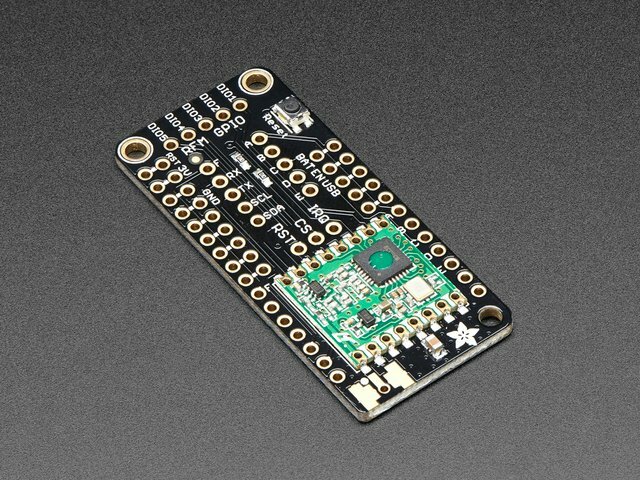 Alternatively you can use the Feather M0 RFM69 board but be sure you've loaded the adafruit-circuitpython-feather_m0_rfm69-*.bin version of CircuitPython on your board! This is very important as the RFM69 build has special pins added to the board module which are used to access the radio's control lines! 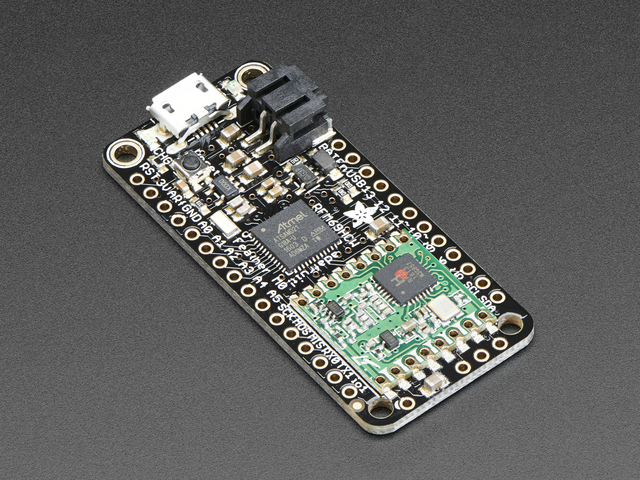 Next you'll need to install the Adafruit CircuitPython RFM69 module on your CircuitPython board. Before you do that make sure you are running the latest version of Adafruit CircuitPython for your board too (again be sure to the load the Feather M0 RFM69 version if you're using that board and want to use its built-in radio module). You can also download the adafruit_rfm69.mpy from its releases page on Github. Before continuing make sure your board's lib folder or root filesystem has the adafruit_rfm69.mpy, and adafruit_bus_device files and folders copied over. To demonstrate the usage of the radio we'll initialize it and send and receive data from the board's Python REPL. You're ready to import the RFM69 module and create an instance of the RFM69 class inside it. Before you create the radio module instance you'll need to check if you're using a 433mhz or 915mhz radio module as the initializer requires the frequency to be specified--confirm which frequency your module uses and run one of the following lines. spi - The SPI bus connected to the board. cs - The DigitalInOut instance connected to the CS line of the radio. reset - The DigitalInOut instance connected to the RST or reset line of the radio. frequency - The frequency in megahertz of the radio module. Remember this frequency depends on which type of radio you're using and the frequency you desire to use! baudrate - The baud rate to use for the SPI connection to the radio. By default this is 10mhz which is as fast as the radio can handle, but in some cases it might be too fast if you're wiring up a breakout to a breadboard (breadboards can be notorious for not working well with high speed signals). If you run into odd errors like being unable to find the RFM69 radio try lowering the baudrate by specifying a baudrate=1000000 keyword (which sets the speed to a lower 1mhz value). Once the RFM69 class is created and initialized you're ready to start sending and receiving data. Remember by default the module will be configured to interface with the "RadioHead" RFM69 setup so you can also send and receive packets with an Arduino running the 'raw' TX/RX examples! Remember you can only send a message up to 60 bytes in length at a time! Attempting to send a message longer than 60 bytes will fail with an exception error. If you need to send a longer message it will have to be broken up into multiple send calls and reconstructed on the receiving side. If you have another RFM69 on the same frequency and modulation waiting to receive messages (like another CircuitPython module running receive code below) you should see it receive the message. To receive a message simply call the receive function. This function will wait for half a second for any packet to be received. If a packet is found it will be returned as a byte string (remember packets are at most 60 bytes long), or if no packet was found a result of None is returned. rfm69.receive(timeout_s=5.0)  # Wait 5 seconds instead of 0.5 seconds. Notice this code first receives a packet, then checks if one was actually found (the packet is not None check--if no packet is received a value of None is returned), and then converts the packet data to a string assuming an ASCII text encoding. encryption_key - This is an optional 16 byte string that defines the AES encryption key used by the radio for sending and receiving packets. Both the sending and receiving code must have the exact same encryption key set or they'll be unable to see each other's packets! See the simpletest.py example below for an example of setting the encryption_key to match the default key from RadioHead library raw examples. By default the RFM69 class assumes no encryption key is set, and you can set this property to the value None to disable encryption. rssi - The received signal strength indicator is a property you can read to see the strength of the radio signal being received. This is updated when packets are received and returns a value in decibels (typically negative, so the smaller the number and closer to 0, the higher the strength / better the signal). That's all there is to the basic RFM69 radio usage! Remember the CircuitPython module is designed for sending and receiving small up to 60 byte control messages and not large or high bandwidth amounts of data. Here's a complete example of sending a message and waiting to receive and print any received messages. Save this as main.py on your board and open the serial REPL to see it print data and any received messages. If you have two boards and radios setup to run this code at the same time they'll send each other a message on start up! # modulation and packet format for the radio. # module! Can be a value like 915.0, 433.0, etc. # on the transmitter and receiver (or be set to None to disable/the default). # Send a packet. Note you can only send a packet up to 60 bytes in length. # call will wait for the previous one to finish before continuing. # rate, in fact it can only receive and process one 60 byte packet at a time. # and receiving a single message at a time. # If no packet was received during the timeout then None is returned. # sending side is sending ASCII data before you try to decode! Before beginning make sure you have your Feather working smoothly, it will make this part a lot easier. Once you have the basic Feather functionality going - you can upload code, blink an LED, use the serial output, etc. you can then upgrade to using the radio itself. You will, of course, need at least two paired radios to do any testing! The radios must be matched in frequency (e.g. 900 MHz & 900 MHz are ok, 900 MHz & 433 MHz are not). They also must use the same encoding schemes, you cannot have a 900 MHz RFM69 packet radio talk to a 900 MHz RFM96 LoRa radio. This is a really great Arduino Library, so please support them in thanks for their efforts! Place the RadioHead library folder your arduinosketchfolder/libraries/ folder. Load this code into your Transmitter Arduino/Feather! Before uploading, check for the #define RF95_FREQ 915.0 line and change that to 433.0 if you are using the 433MHz version of the LoRa radio! Uncomment/comment the sections defining the pins for Feather 32u4, Feather M0, etc depending on which chipset and wiring you are using! The pins used will vary depending on your setup! #define RFM95_RST     11   // "A"
#define RFM95_CS      10   // "B"
#define RFM95_INT     6    // "D"
#define RFM95_RST     27   // "A"
#define RFM95_CS      33   // "B"
#define RFM95_RST     7   // "A"
#define RFM95_CS      11   // "B"
#define RFM95_INT     31   // "C"
#define RFM95_RST     9   // "A"
#define RFM95_INT     4    // "C"
// The default transmitter power is 13dBm, using PA_BOOST. delay(1000); // Wait 1 second between transmits, could also 'sleep' here! Now open up another instance of the Arduino IDE - this is so you can see the serial console output from the TX Feather while you set up the RX Feather. This code will receive and acknowledge a small packet of data. Make sure the #define RF95_FREQ 915.0 matches your transmitter Feather! You can see that the library example prints out the hex-bytes received 48 65 6C 6C 6F 20 57 6F 72 6C 64 20 23 30 0 20 20 20 20 0, as well as the ASCII 'string' Hello World. Then it will send a reply. You can then instantiate the radio object with our custom pin numbers. Remove the while (!Serial); line if you are not tethering to a computer, as it will cause the Feather to halt until a USB connection is made! Its pretty simple, the delay does the waiting, you can replace that with low power sleep code. Then it generates the packet and appends a number that increases every tx. Then it simply calls send to transmit the data, and passes in the array of data and the length of the data. Note that this does not any addressing or subnetworking - if you want to make sure the packet goes to a particular radio, you may have to add an identifier/address byte on your own! Then you call waitPacketSent() to wait until the radio is done transmitting. You will not get an automatic acknowledgement, from the other radio unless it knows to send back a packet. Think of it like the 'UDP' of radio - the data is sent, but its not certain it was received! Also, there will not be any automatic retries. It also prints out the RSSI which is the receiver signal strength indicator. This number will range from about -15 to about -100. The larger the number (-15 being the highest you'll likely see) the stronger the signal. It's easy to use the RFM9x LoRa radio with CircuitPython and the Adafruit CircuitPython RFM9x module. This module allows you to easily write Python code that sends and receives packets of data with the radio. Be careful to note this library is for the RFM95/96/97/98 LoRa radio only and will not work with the simper RFM69 packet radio. You can only send and receive packets up to 252 bytes in length at a time. The size of the radio's internal buffer dictates this limit so if you want to send longer messages you'll need to break them into a series of smaller send calls in your application code. Receiving packets is a 'best effort' in pure Python code. Unlike the Arduino versions of the RFM9x library there is no interrupt support which means when a packet is received it must be immediately processed by the Python code or it could be lost. For your application it will work best to only receive small, single packet messages at a time. Don't try to receive kilobytes of data or else you'll lose packets. This module is really intended for simple single packet messages like 'ON', 'OFF', etc. The module is written to be compatible with the RadioHead RFM95 Arduino library. This means by default the module will setup the radio with the same modulation and configuration for transmitting and receiving at the maximum distance with LoRa support. In addition the CircuitPython module uses the same packet preamble (8 bytes) and header (4 bytes) as RadioHead. If you want to use different modulations or settings you'll need to configure the radio yourself after carefully consulting the datasheet. The CircuitPython module does not support advanced RadioHead features like guaranteed delivery or its internal node addressing scheme. Only the simple 'raw' RadioHead examples are supported (i.e. broadcasting a packet to all listening radios). Encryption and sync words are also not supported by the LoRa radio module. You must perform these operations yourself in your application code if they're desired. Alternatively you can use the Feather M0 RFM9x board but be sure you've loaded the adafruit-circuitpython-feather_m0_rfm9x-*.bin version of CircuitPython on your board! This is very important as the RFM9x build has special pins added to the board module which are used to access the radio's control lines! This is the Adafruit Feather M0 RFM96 LoRa Radio (433 MHz). We call these RadioFruits, our take on an microcontroller with a "
Next you'll need to install the Adafruit CircuitPython RFM9x module on your CircuitPython board. 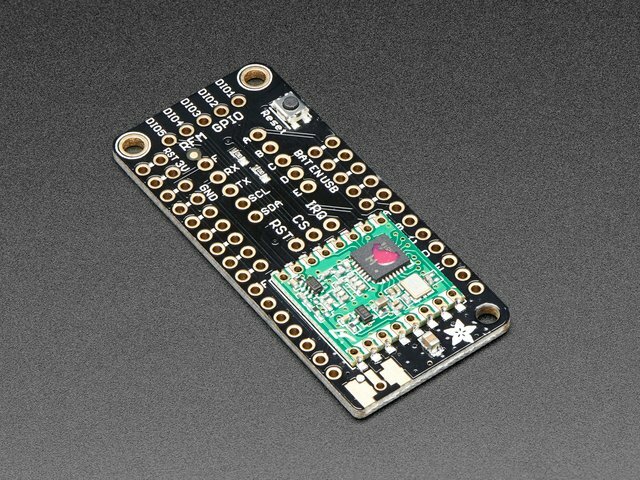 Before you do that make sure you are running the latest version of Adafruit CircuitPython for your board too (again be sure to the load the Feather M0 RFM9x version if you're using that board and want to use its built-in radio module). You can also download the adafruit_rfm9x.mpy from its releases page on Github. Before continuing make sure your board's lib folder or root filesystem has the adafruit_rfm9x.mpy, and adafruit_bus_device files and folders copied over. You're ready to import the RFM9x module and create an instance of the RFM9x class inside it. Before you create the radio module instance you'll need to check if you're using a 433mhz or 915mhz radio module as the initializer requires the frequency to be specified--confirm which frequency your module uses and run one of the following lines. baudrate - The baud rate to use for the SPI connection to the radio. By default this is 10mhz which is as fast as the radio can handle, but in some cases it might be too fast if you're wiring up a breakout to a breadboard (breadboards can be notorious for not working well with high speed signals). If you run into odd errors like being unable to find the RFM9x radio try lowering the baudrate by specifying a baudrate=1000000 keyword (which sets the speed to a lower 1mhz value). Once the RFM9x class is created and initialized you're ready to start sending and receiving data. Remember by default the module will be configured to interface with the "RadioHead" RFM9x setup so you can also send and receive packets with an Arduino running the RFM95 TX/RX examples! Remember you can only send a message up to 252 bytes in length at a time! Attempting to send a message longer than 252 bytes will fail with an exception error. If you need to send a longer message it will have to be broken up into multiple send calls and reconstructed on the receiving side. If you have another RFM9x on the same frequency waiting to receive messages (like another CircuitPython module running receive code below) you should see it receive the message. To receive a message simply call the receive function. This function will wait for half a second for any packet to be received. If a packet is found it will be returned as a byte string (remember packets are at most 252 bytes long), or if no packet was found a result of None is returned. rfm9x.receive(timeout_s=5.0)  # Wait 5 seconds instead of 0.5 seconds. tx_power - This is a power level (in dB) to use when transmitting with the radio. By default this is set to a moderate 13 dB value, however you can increase this depending on the type of radio you're using. For high power radios (the modules sold by Adafruit) they support a range of TX power from 5 to 23 dB. Try increasing this to the maximum 23 dB level (however check your local laws for permission to transmit with such power!) to get the most distance and range. That's all there is to the basic RFM9x radio usage! Remember the CircuitPython module is designed for sending and receiving small up to 252 byte control messages and not large or high bandwidth amounts of data. Which gives better range, LoRa or RFM69? All other things being equal (antenna, power output, location) you will get better range with LoRa than with RFM69 modules. We've found 50% to 100% range improvement is common. What ranges can I expect for RFM69 radios? The RFM69 radios have a range of approx. 500 meters line of sight with tuned uni-directional antennas. Depending on obstructions, frequency, antenna and power output, you will get lower ranges - especially if you are not line of sight. What ranges can I expect for RFM9X LoRa radios? The RFM9x radios have a range of up to 2 km line of sight with tuned uni-directional antennas. Depending on obstructions, frequency, antenna and power output, you will get lower ranges - especially if you are not line of sight. I don't seem to be getting the range advetised! Is my module broken? Your module is probably not broken. Radio range is dependant on a lot of things and all must be attended to to make sure you get the best performance! Max power settings on the radios - they can be set for higher/lower power! Don't forget to set them to max. How do I pick/design the right antenna? But nothing beats actual tests in your environment! This guide was first published on Aug 24, 2016. It was last updated on Aug 24, 2016. Get your WiFi projects up and running quickly with the fast and flexible WICED Feather!